GUK will recruit for various total 828 Posts. 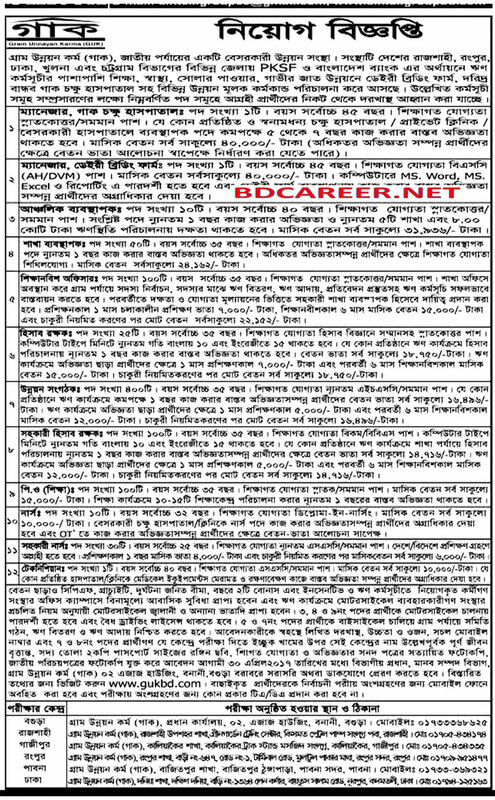 Gram Unnayan Karma GUK Job Circular April 2017. Application Deadline 30 April 2017. Gram Unnayan Karma (GUK) will recruit for various total 828 Posts circulated a Recruitment Advertise of Job Opportunity on 03 April 2017. Interested and eligible Bangladeshi Citizenship candidates are requested to apply after fulfilling the circularized conditions and instructions. Deadline for Submitting Application is 30 April 2017. Published Date: 03 April 2017. Application Deadline: 30 April 2017. How to Apply: Interested candidates may Apply through Own handwriting full Bio-Data with Mobile Number and attested Photocopies of all educational certificates, National Identity Card, Citizenship Certificate, Reference of 2 persons with Mobile Number, 2 copies of recent passport size color photograph with other related documents as per the circularized conditions and instructions will be sent to Head of HRD, Gram Unnayan Karma (GUK), 02 Ajaj Housing, Banani, Bogra-5800. The Name of the post and respective District of applicant write on the envelope clearly. Application reaches within office time on or before 30 April 2017.